NETWORK FINALS: SPEECHLESS rose 0.1 in final numbers. CABLE HIGHLIGHTS: ESPN’s NBA doubleheader bookended the Top 3 slots on Wednesday cable at 0.71/0.58. Between them was VH1’s BLACK INK CREW, up 0.08 to 0.63, with the premiere of BEAUTY BAR as lead-out at 0.32. Discovery’s STREET OUTLAWS was at 0.50, followed by the premiere of TWIN TURBOS at 0.36. It was a strong night for MSNBC’s RACHEL MADDOW SHOW, in the Top 5 at 0.39/0.63/3.3M, above Fox News’s TUCKER CARLSON TONIGHT at 0.27/0.50/3M and CNN’s ANDERSON COOPER 360 at 0.24/0.32/1.3M. On TLC, MY 600-LB LIFE lost 0.03 to 0.39, followed by the premiere of 685-LB TEEN at 0.37. FX’s AMERICAN CRIME STORY: THE ASSASSINATION OF GIANNI VERSACE returned from a week off with a one-tenth jump to 0.34. OWN’s IF LOVING YOU IS WRONG ticked up to 0.31. On HGTV, PROPERTY BROTHERS ticked down to 0.31, HOUSE HUNTERS gained 0.04 to 0.30, and HOUSE HUNTERS INTL was up 0.02 to 0.27. On ID, SEE NO EVIL shed a tick to 0.31, and HOMICIDE CITY was down 0.03 to 0.30. Food Network’s GUY’S GROCERY GAMES slipped 0.02 to 0.30. The finale of Paramount’s WACO rose 0.05 to 0.29, and the CMT simulcast was down 0.04 to 0.05. MTV’s CATFISH dropped 0.07 to 0.27. On Lifetime, LITTLE WOMEN fell 0.08 to 0.23, and GLAM MASTERS premiered at 0.14. On Freeform, GROWN-ISH returned from a week off down a tick to 0.23, and ALONE TOGETHER ticked up to 0.10. On Syfy, the just-renewed THE MAGCIANS dipped 0.02 to 0.21, and CHANNEL ZERO was down 0.02 to 0.08. 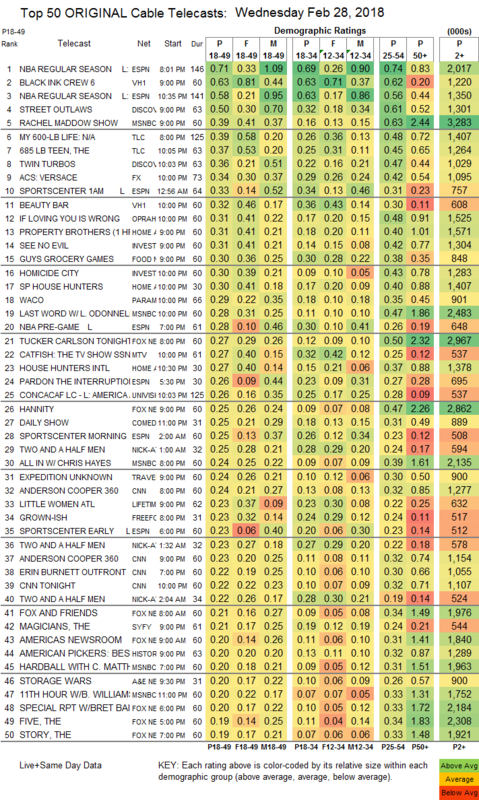 On A&E, STORAGE WARS lost 0.02 to 0.20, and ROOSTER & BUTCH held at 0.10. 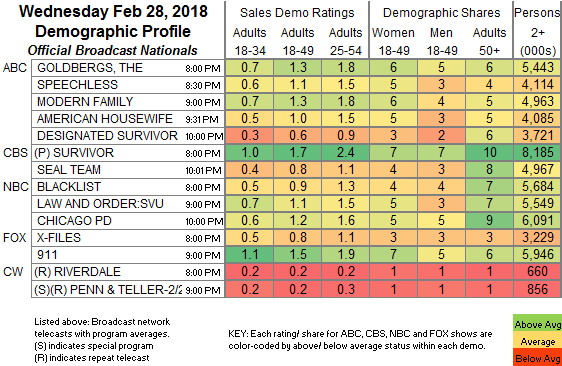 The season premiere of E!’s HOLLYWOOD MEDIUM was at 0.18. On POP, SCHITT’S CREEK gained 0.02 to 0.10, and LET’S GET PHYSICAL was as usual off the chart at 0.01/81K. Comedy Central’s just-renewed CORPORATE fell 0.04 to 0.09.